Note:The Club of Rome was founded in 1968 by Italian industrialist, Aurelio Peccei as a global think tank that deals with a variety of international political issues and "the problematique". The Club comprises of "scientists, economists, businessmen, international high civil servants, heads of state and former heads of state from all five continents who are convinced that the future of humankind is not determined once and for all and that each human being can contribute to the improvement of our societies." It has been argued that the Club is a Neo-Malthusian organization. Thomas Robert Malthus had argued that birth rate needs to be lowered. The Club's 1972 report, "Limits to Growth" chose not to engage with the world's richest 20 per cent of the population that consume 86 per cent of its goods and services and did not suggest ways to reverse the trend. In another book, The First Global Revolution by the Club, it is made to appear as if democracy is responsible for the sluggish economy, the scarcity and uncertainties. Fake democracy is responsible indeed. There is need for more genuine participatory democracy especially in dealing with natural resource because 'representation politics' of parliamentary democracy stands exposed by representing the interest of the top 20 % of the population. Pursuing Club of Rome path, Richard Haass, the current president of the Council on Foreign Relations has argued for a system of world government where sovereignty of nations is eliminated in the name of fighting a common global problem. On the web there is a reference to European power elite groups such as the Committee of 300 (a secret society founded by the British aristocracy in 1727) and the Bilderberg Group. It is submitted that the 'Committee of 300' modeled after the British East India Company's Council of 300 which was founded by the British aristocracy in 1727 dictates the affairs of Europe and the world continues the way they dictated opium trade with China. Bilderberg Group is credited with writing the political landscape of the world. This may not be exactly true but the concentration of 'political power' in a handful of corporations and financial institutions does reveal a pattern not unlike what is suggested by groups who sound like conspiracy theorists. The fact is there is no conspiracy. It is all quite open, only the dots need to be linked. The invented fear of population by 'political powers' may be one of the several reasons for environmental movement in the global north but in the global south it emerged to save the substratum for the survival of human beings and other living species. Green generation of global north and global south view environment differently but convergence is unfolding among the south in the global north and the real 'south' in the global south where elites can no longer hide behind the poor population and indulge in victim blaming exercise. Stockholm, 1972. Five years after the Summer of Love, four after the Paris riots; the Cold War is in full swing. The Club of Rome has just projected a future in which the demands of a growing human population outstrip the Earth's capacity to provide. The blue whale, the biggest animal that ever lived, has been hunted almost to extinction. Atom bomb tests continue to garnish the world in strontium-90; and from Japan to Europe to North America, man-made poisons are affecting plants, animals and people. Economically, the world has never had it so good. 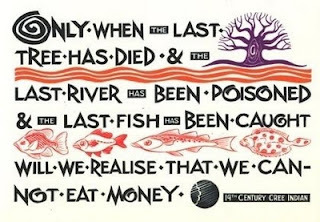 But governments are beginning to realise that nature is paying a price. On 5 June 1972, in the Swedish capital, they began to build their response, in the form of the United Nations Conference on the Human Environment - the first UN summit on the environment, and the event that really put the issue on the global political agenda. Outside the negotiations, two entirely different groups had also assembled, with a self-appointed brief of keeping the negotiators on track. One was a small group of scientists who were becoming desperately concerned about population growth, pollution and rapidly increasing use of natural resources. The other was a much larger gathering of people from what we would now call civil society, or environmental campaign groups, who used the now familiar smorgasbord of marches, song, demonstrations and dialogue to press issues from pollution control to civil rights to vegetarianism. "My motivation was the message from Rachel Carson and her book Silent Spring," recalls Jan-Gustav Strandenaes, one of the 10,000 or so making up the Peoples' Forum. "It brought together a number of issues we'd read about but not really thought about: the Minamata disaster in Japan where all these people were killed by mercury poisoning in water and fish, and there was a similar one in Sweden where they had hormone-disturbing liquids buried in the ground contaminating the fresh water. "I was looking at these as isolated incidents until I read Rachel Carson's book." Silent Spring's main thrust was the damage being wrought on American wildlife by the indiscriminate use of newly invented herbicides and pesticides. But the wider narrative it told, encompassing Minamata and other incidents, was of human technology running out of control. The issue was elevated by the appearance in Stockholm of people who had survived the Minamata disaster - the poisoning, the physical and mental symptoms and the corporate cover-up - and by veterans of the war in Vietnam, where the US military's use of defoliant chemicals such as Agent Orange sought to destroy a guerrilla army by ripping out forests and fields, at a huge cost to people's health. The involvement of this nascent people's movement in a UN summit was unprecedented. Although the Swedish government and the conference organisers officially welcomed the Peoples' Forum, it is clear that not all government delegates knew what to make of it. But inside the official negotiations, many delegates offered a similar message. Indian Prime Minister Indira Gandhi told the conference: "It has been my perception that people who are at cross purposes with nature are cynical about mankind and ill at ease with themselves. "Modern man must re-establish an unbroken link with nature and with life." But developing countries - which had just acquired a new champion with the accession of China to the UN (at the expense of Taiwan) - raised another set of issues that almost ended the summit before it had begun. "Developing countries were considering boycotting the conference," recalls Maurice Strong, the Canadian-born environmental diplomat who chaired the Stockholm summit for the UN. "They thought this new concern of 'environment' was one for the rich and would distract from their main concerns, which were the relief of poverty and continuing development." National and factional politics also surfaced in several guises. Most obviously, the Soviet Union and its allies stayed away, as communist East Germany did not have a seat at the UN table. That meant only 113 nations were present. The other superpower, though, was very much the focus of attention - particularly when Sweden's Prime Minister Olof Palme raised in dramatically undiplomatic terms the US actions in Vietnam, which he termed "ecocide". "The indiscriminate bombing, the large-scale use of bulldozers, the use of herbicides, is an outrage," he said. "Our experience is that the active use of this ecological warfare is coupled to a passive resistance even to discuss it." In Stockholm, the US remained resistant to discussing it. But in alliance with some of the campaign groups, it found a way to deflect the negative press it was receiving on the issue, by focusing on whaling. The US had by then stopped its own commercial whale hunts - so had its allies, the UK, Germany and the Netherlands. The only two countries carrying on were the USSR and Japan - which happened to be, respectively, its main political and economic rivals. Despite the fact that whaling had not been raised as a major issue in documents governments had prepared leading up to the conference, a resolution was passed calling for a moratorium on commercial whaling - which is possibly the outcome that commanded most headline inches. It may have been ecologically justified - but there is little doubt that the main motivation was political, at least on the governmental level. It was not, however, the most profound outcome. One concrete move was the decision to establish a United Nations Environment Programme. But more significant, in the long term, was the new philosophy evident in the final declaration; that nations had to work together on environmental issues, and that a healthy environment was essential for the long-term prosperity of developing countries. For the first time, governments acknowledged that technology could seriously damage the environment. They agreed that each country had a duty not to pollute others, and that threatened species needed international protection. Not everyone was happy. The eminent US biologist Barry Commoner, for example, argued that the conference declaration did not go far enough; rather than agreeing to monitor pollution, he said, governments should have been discussing how to develop industries that produced no pollution in the first place. But Jan-Gustav Strandenaes recalls that on a political level, the impact of the Stockholm agreement - made, as has become customary, in painfully long overnight negotiating sessions - was immediate. "No country in the world had a ministry of the environment before Stockholm; and I know that the Norwegian delegation raced back to Oslo and established a ministry, and they beat the Swedes by a few weeks. "So Stockholm started something; it put the environment on the political agenda." Internationally, that agenda would lead in 1987 to the Brundtland Commission and its famous definition of a sustainable society as one that "meets the needs of the present without compromising the ability of future generations to meet their own needs". It would lead to the Rio de Janeiro Earth Summit in 1992, which gave birth to UN conventions on climate change, biodiversity and desertification, and the Agenda 21 "roadmap" to sustainable development. The next milestone is also in Rio - the UN Conference on Sustainable Development, nicknamed Rio+20 - which is scheduled to bring about 130 world leaders as well as ministers, diplomats, business moguls and an estimated 70,000 activists to Brazil later this month. And many would argue that the need for decisive action is bigger than ever. Governments have done many things since Stockholm to alleviate poverty and stem environmental decline; but still, a billion people live in hunger, and damage to nature progresses. Now 83, and still very much involved, Maurice Strong has mixed views on whether this month's Rio summit will bring profound change. "I am analytically pessimistic; I believe we are in danger of not doing what we must do for the survivability of human life and its sustainability," he says. "But I am operationally optimistic, because as long as there is hope - and there is still hope - we must continue to work for it." "The Club of Rome has just projected a future in which the demands of a growing human population outstrip the Earth's capacity to provide"
The Limits To Growth predictions, much villified at the time, have proven remarkably robust with 40 years of hindsight. What have we done to avoid the consequences? It began among scientists in 1957 with the International Geophysical Year, the first real attempt to coordinate planetary scale investigations. The Green planet concept may have caught on in 1969 when the Earthrise photograph from Apollo 8 gave a single view of a blue planet. Pity we're making such a mess of our 8000 mile ball of rock. 22 - Eddy - That's likely true, but a bit of a misnomer; atomic bombs are designed to create as little fallout as possible, whereas a nuclear reactor works on a totally different principle. In any case, >99.5% of background radiation is natural or from medical sources. If only we paid as much attention to the emissions from fossil fuels, the world would be a much healthier place. Unfortunately our world will never be green until we get rid of all politicians and the business owners who pay them huge amounts of money to turn the other way ! "...Atom bomb tests continue to garnish the world in strontium-90..."
I read the amount of radioactive isotopes released by all N-tests is tiny compared with that routinely discharged by Sellafield into the sea over the years, and accidents such as Chernobyl, Fukushima etc. However, A test-attributed leukaemia incidence in the US, in the 1960s, led to the atmospheric test ban.
' 11 BluesBerry " stop HEDGE FUNDS from betting on commodities." A noble cause, set back 20 years by the espousal of a bunch of wackos. "These greens are who I blame"
& you'd be 100% wrong to do so. Nuclear was 10x more expensive to build than coal and higher operational costs. Purely econonics & oil getting their way. The implementation was purely as part of wider cold war objectives. 11. BluesBerry "5. stop HEDGE FUNDS from betting on commodities." Tax them out of business! Speculators really are the evil that they have been made out to be over the millennia. We need exchange control to prevent all currency/commodity speculation and to only allow currency transactions that relate to the actual movement of goods. E.G oil futures should only be for people who need oil! This is a philosophical question. After spending billions over the decades on improved sanitation, access to water, medical care in developing countries, world population has increased and live longer. So the problems of yesterday have just popped up in a different guise, i.e. environmental issues. The question is once we've solved environmental problems what will replace them? If we had the will, we would find a way, but the will of most important countries - for most part western countries - lies with black oil (Never mind how many spills. ), warfare e.g. Iraq, Afghanistan, Libya, where depleted uranium & colourful agents like Orange cause deformities, death & earth-pollution. The world belongs to the elite; the rest of us are collateral damage & highly disposable. Most within the early green movement were motivated by a desire to save the planet, they were shocked by the damage being done. But the people who control the power behind the modern green movement have a very different agenda. They are devout agrarian socialist that believe in a future devoid of ownership and technology. They will stop at nothing to bring their dreams into being. Q. What if it rains? A. I wouldn't go fishing out there if I were you. A. We got 2 1/2 the salary! We had families to feed. It's a shame; the green movement started from noble beginnings & helped clean up vehicle emissions, greatly improving air quality. Now however they're more intent on hindering scientific progress in the name of self-promotion & profit. They've become as irresponsible as the big oil & chemical companies of the 70s they once fought against. They’re now a lunatic fringe; we need their sanity back. Rwanda, still grappling with poverty, has chosen to lead by example. In its national strategy "Green Growth and Climate Resilience" November 2011, Govt of Rwanda lays out a plausible path to achieving the ambitious development targets of Vision 2020 in a way that is SUSTAINABLE = object lesson of achievement in face of difficulty. If Rwanda can do it, where is your country's submission? 5. stop HEDGE FUNDS from betting on commodities. Definition of a sustainable society: "meets the needs of the present without compromising the ability of future generations to meet their own needs". This definition is unenforceable & therefore lame because the superpowers, one in particular, has all encompassing interest in meeting its own needs NOW without care about the deformities, deaths, the poisoning of the earth. Nothing to celebrate about 40 years of hindering our progress. These greens are who I blame for our almost complete abandonment of nuclear technology and for our continued need for fossil fuels and the subsequent damage to the environment. People should dig into the backgrounds of the leadership of the Green movements, most of 'em are rich toffs who want us all back in their fields. While we need to take care of our environment and conduct our affairs in a sustainable manor, the World population had risen from 3.8 Billion to 7 Billion since 1972. How is that sort of growth rate sustainable ? 3. HungeryWalleye "indefinite growth...a madman or an economist"
I think you will find that the 'or' in the above is wrong. Economists do not believe in anything; they are just the mouthpieces of their paymasters - the banks! On the other hand do we have the right to impoverish and starve our fellow man by depriving them of the basics of life just because the provision will harm the planet? Like the health & saftey idea this organisation has now outlived it's usefullness and needs to be disbanded!! Science wont save us. The problem is how we see our place in the world, only changing that view will give us a future. The world does not belong to us to conquer, control and have dominion over,, but rather we belong to the world. "For the first time, governments acknowledged that technology could seriously damage the environment." Don't throw the technology out with the bathwater. It's the indiscriminate use of the technology that has caused the problem and it is the correct use of the technology that will save us. Well at least to allow 7,10, 15 Billion? to co-exist on this tiny planet. To accept the simple notion that what we do within the whole has consequences for all else within the whole and upon the whole is to see reality with changed perspective,-- but as if through a window, as an observer. To open the door and engage with reality is no easy matter, for me much stumbling as self interest struggles to merge with the whole. Woo woo ? No,-- beginners steps ! "On 5 June 1972 in the Swedish capital they began to build their response, in the form of the United Nations Conference on the Human Environment"
Why does everything happen on my birthday! For once why can't it be the 4th or 6th of June! Be careful when you bang on about the environment as today's 'scientific' certainties may not be as certain tomorrow! I fear this is the error we often make.